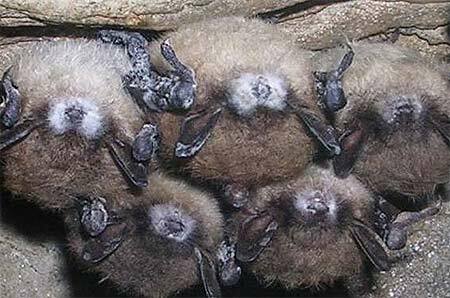 Fungus that causes White Nose Syndrome discovered in six Caves in the Texas Panhandle. Texas has the highest diversity of bats in the nation: 33 documented species in 4 families. And [Texas] is where a lot of eastern and western bats comingle. That’s a problem, says mammologist Jonah Evans, now that the fungus that causes the bat killing disease White Nose Syndrome was discovered this year in six Panhandle counties. The other big concern is our Mexican Free-tailed bats, because they migrate and do not hibernate, they are not expected to suffer the same level of catastrophic impacts from the fungus. However, because they don’t die when they are exposed to the fungus—potentially—that would make them even better at spreading it. It is sort of a bat Armageddon situation. Mexican Free-tail bats migrate in huge numbers across the Americas, creating concern they may spread the fungus. When really susceptible species get the fungus, usually about 80 percent of the mortality happens in the first year that the disease turns up. What that tells us is that we have to be very proactive on the front end. We have to really start doing something soon. If we wait, we’re going to be trying to treat these stragglers that are left over, and the bulk of the population will be lost. Researchers continue searching for treatments and cures. Find information about White Nose Syndrome, and decontamination protocol for cavers, on the Texas Parks and Wildlife website. … but at levels too low to detect. So, when you look at the maps of the spread of the fungus across the united States, those maps are always going to be behind where the disease actually is. Researchers discovered six caves in six Panhandle counties with the fungus. These are locations where we had previously identified as the most likely for the fungus to turn up first. And sure enough, it did. And so, we had expected to see the disease and the fungus to slowly move across Oklahoma towards Texas. For me, personally, it was a bit of a surprise to have it suddenly one year we go there and it’s all over the place. For the past six years, the caves in question have come up clean when surveyed. Likely, it came in at extremely low levels first, and slowly spread. And then, one winter’s worth of growth of the fungus in all of these sites suddenly put it over that threshold where we are now able to detect it. 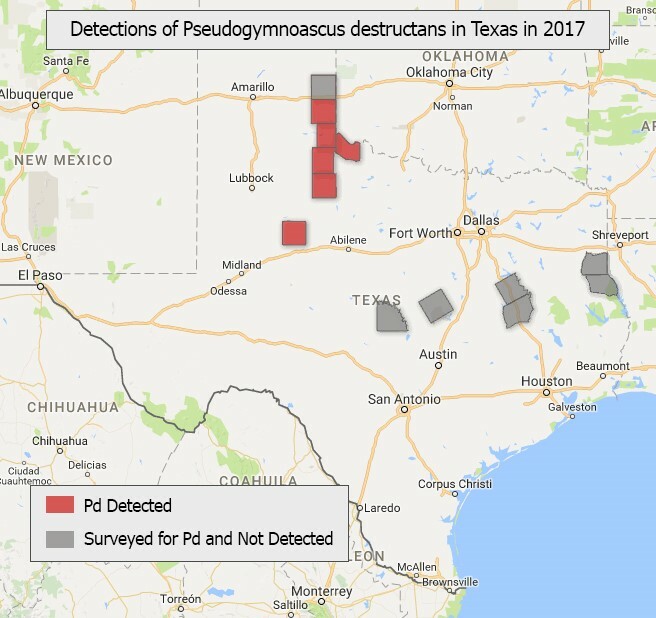 Find more information on White Nose Syndrome in bats, and decontamination protocol if you go caving, on the Texas Parks and Wildlife website. You are currently browsing the archives for the White Nose Syndrome category.